Originally Appeared in the Summer 2015 issue of Resource Magazine. You can view the PDF here. Before dawn, a young male lion walks down a deserted road, letting loose a gentle roar. 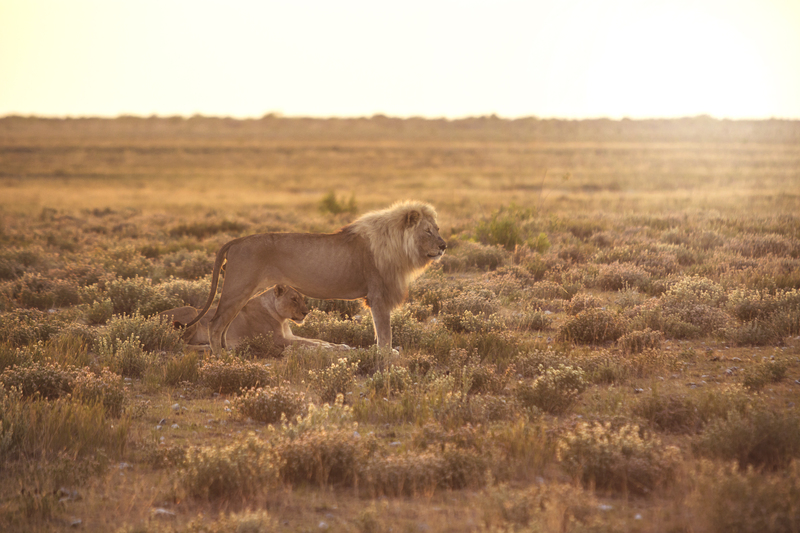 In the distance, the call is heard and the pride’s lioness responds, directing her young son back after a night of hunting across the grasslands that surround the Etosha Pan. My wildlife guide and I cautiously follow the lost male, as he explodes into a full sprint once he spots his young brother. After a playful embrace the pride is reunited. They then settle into the barren landscape to wait out the harsh African sun. Once darkness arrives, the pride will resume their hunt. This is Namibia. And your wildlife expedition has begun. A male lion and his lioness wait for their young male cubs to return to the Pride after a night hunting in Etosha National Park, Namibia. Getting to Namibia is not as expensive as you may think. From any major hub in the U.S., prices for round trip airfare ranges between $1,200 and $2,000. The duration of the trip can be overwhelming, with most options averaging 25 to 35 hours of travel time. As most flights route through South Africa, be sure to have empty Passport pages and allow time for your layover, as you’re forced to go through customs on all connecting flights outside of the same airline. 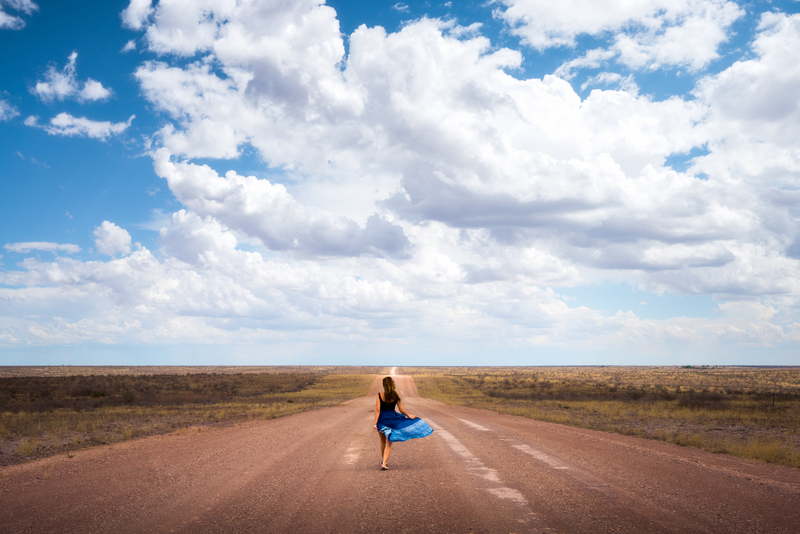 If your holiday time is not a factor, you can also rent a car and make the eight hour drive from Cape Town, South Africa to the Namibian Border. Namibia is truly one of the only places in the world where the dunes actually meet the sea. 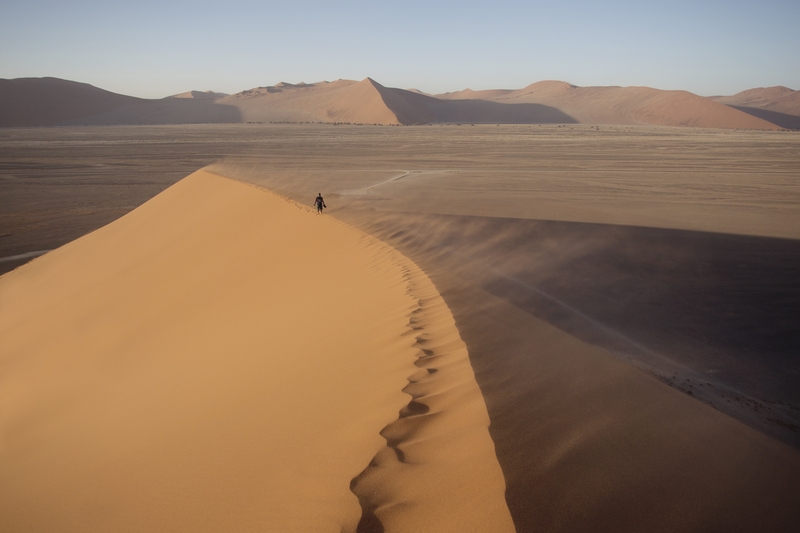 Hop on a flight with Scenic Air to get the best view of the Namib desert. Namibia and its surrounding regions were made for road trips. And with a lack of any form of public transportation, it’s really your only option. 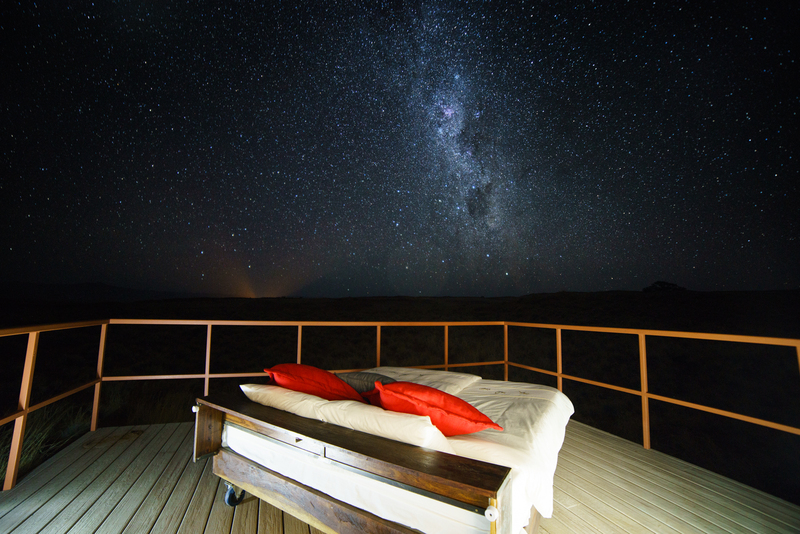 Camping is easy, however, and is by far the best way to experience the famous night skies, where the Milky Way seems to be within arm’s reach. Most car rental agencies provide camping ready vehicles complete with a rooftop tent and cooking supplies. Basic 4×4 Camper Vans can range from $60 a day in the off season, to $150 per day in the peak months of July and August. But if you want a cool-looking Toyota Land Cruiser camper to incorporate into your adventure photographs, you’ll be paying between $100 and $200 per day, depending on the season. If living under the stars isn’t your thing and you prefer to stay in hotels, Toyota Hilux 4×4 trucks are available for slightly less cost than the basic camper van. A 4×4 is necessary if you really want to take advantage of all that Namibia has to offer, from the towering sand dunes to the wet wetlands of the Okavango panhandle. Namibia is beautiful any time of year, but your visit should be based on what’s most important to you. If you want the absolute best conditions to photograph the diverse wildlife, July through October is ideal. This is when the flood plains dry up and the wildlife returns to the permanent waterholes. And of course, this is also the high season, in which prices are doubled and there’s a good chance you won’t be the only photographer at the watering hole when the sun comes up. It’s also winter, so dress warmly! But If solitude is what you seek, then the wet season of December through March will be right for you. When off the coast, in places such as Etosha National Park, you’ll witness beautiful thunderstorms almost every afternoon, complete with lightning strikes every five to 10 seconds. Wildlife viewing, while more difficult, is not impossible. It will require more patience, but when you stumble upon that pride of lions in the early morning light, you will be the only car for miles. Deadvlei is one of the most photographed locations in all of Namibia, but get there at first light, when the fairy tale like scene unfolds, and you may be the only soul for miles. Windhoek is Namibia’s capital city and the start of your African adventure. Clothing, groceries, camping gear and most goods are hard to come by throughout much of Namibia, so plan ahead and buy essential goods here before you hit the road. The Aus Mountains display some of the most scenic vistas in all of Namibia. Hiking and mountain bike trails are abundant. 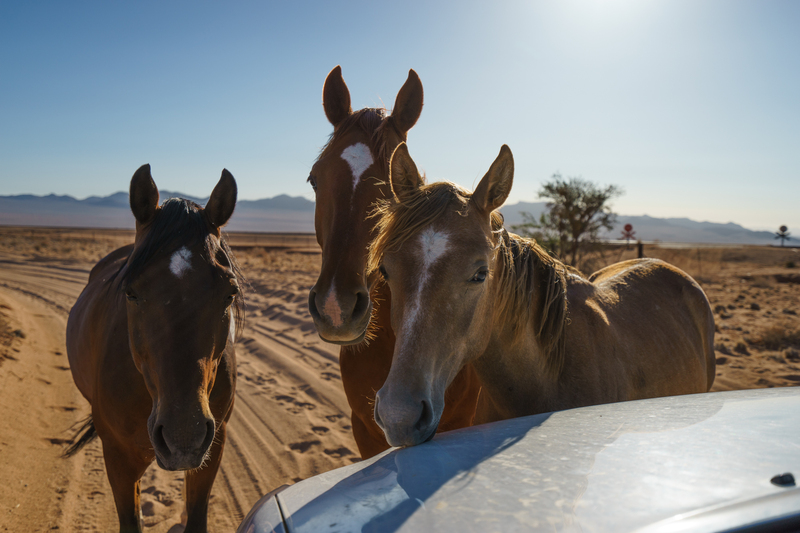 The Aus region is also famous for its beautiful wild horses, which can be easily viewed from a marked lookout point on the road to Luderitz. A family of wild horses came to our car to greet us to the Gondwana Collection Aus-Klein Hotel and Campsite. Kolmanskop was once a small, rich diamond mining town, abandoned by its German occupants in 1954 as the terrain’s diamond supply ran dry. 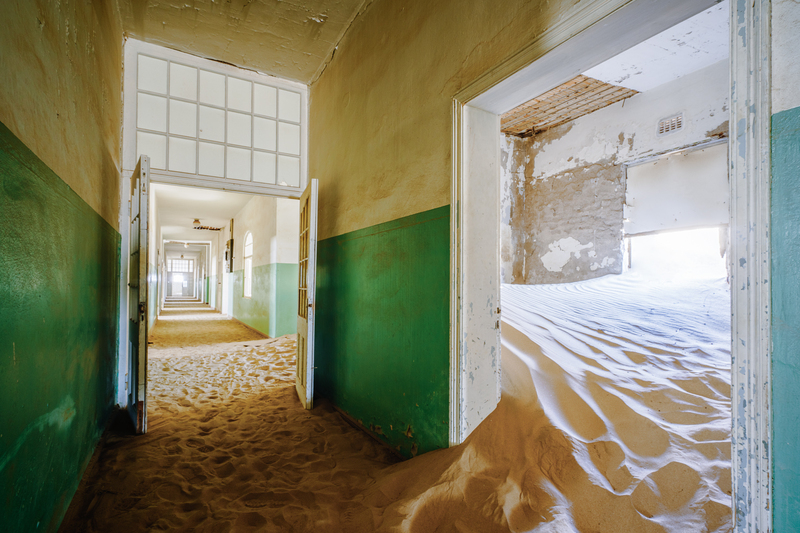 Since then, the harsh Namibian desert has overtaken much of the town, and tourists are able to explore the ghostly architecture while buried knee deep in sand. Always a popular location for photographers and directors, the sand filled rooms have been the backdrop of many productions. The Kolmanskop Ghost Town provides an eerie backdrop for early morning photography. Sossusvlei, the most recognized location in all of Namibia, is home to gigantic red sand dunes surrounding salt and clay pans. 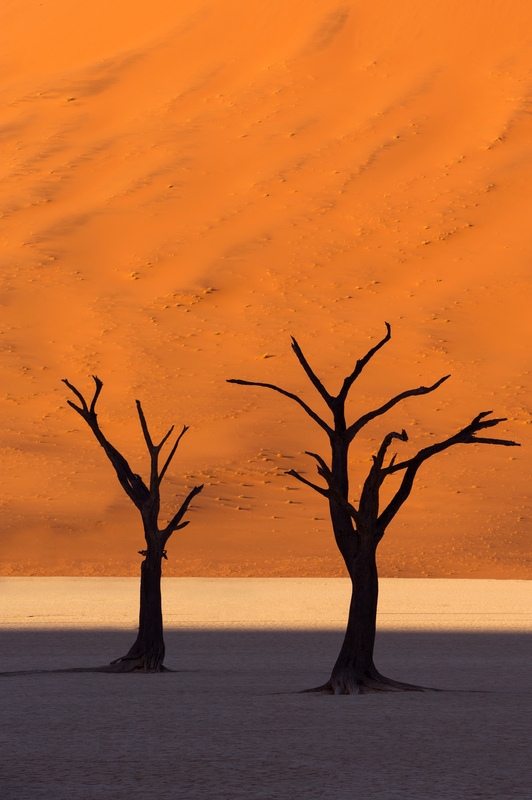 Deadvlei is the main draw, but make sure to arrive early in the morning, as the sun lights the sand dunes in the background, while the clay pan and the skeletons of 900-year-old camel thorn trees remain in the shadows. Other attractions include an infinite array of sand dunes such as Big Daddy, one of the largest in the world. It rises 380 meters, while Dune 45 is the perfect dune to photograph the sunset atop. 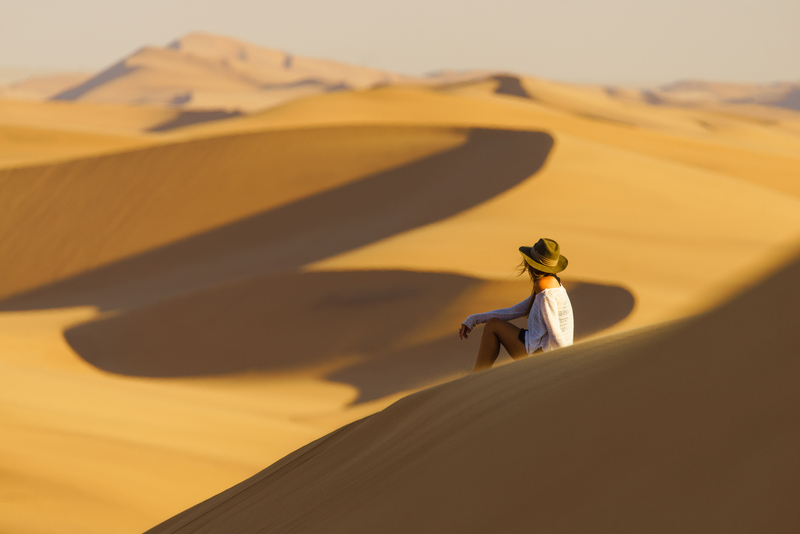 Dune 45, located in the Sossusvlei area of the Namib Desert, is one of the best locations to watch the sunset in all of Namibia. Naukluft Mountain Zebra Park is opposite of Sossusvlei in the Namib Naukluft National Park, a rocky landscape that’s home to a large collection of the Hartmann’s Mountain Zebra. In the early morning and late afternoon, the Zebra descend from the peaks of the surrounding mountains, giving photographers ample opportunity to capture the striped animals in beautiful golden light. The area is also home to many other species of wildlife, including leopard and baboon. 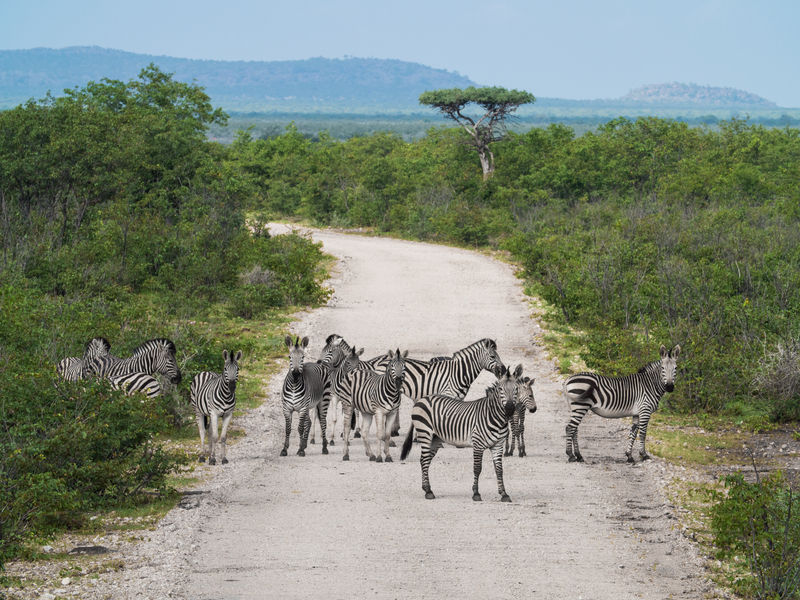 A family of zebras block the road in the Namib-Naukluft National Park. Walvis Bay is a large and industrialized fishing town, and a perfect base-camp for some of the most entertaining attractions in Namibia. In just one morning with Eco Marine Kayak Tours, for example, guests can kayak among hundreds of seals, flamingos and dolphins. With seals sometimes jumping over the nose of your kayak, keeping camera equipment in the provided dry bags is recommended. Afterwards, head over to Sandwich Harbor Tours to embark on a 4×4 journey through the sand dunes. This is where the dunes meet the sea, and is among the greatest views in all of Namibia. Swakopmund is the adventure capital of Namibia. 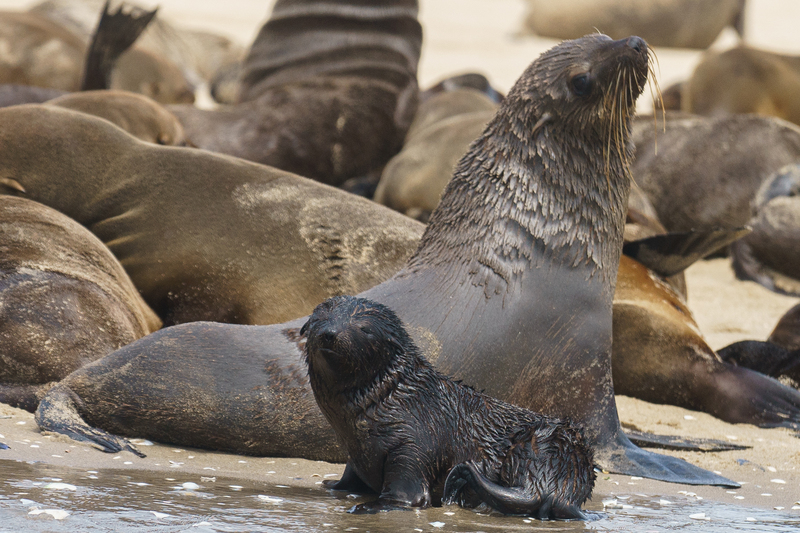 From skydiving to ATV tours, Swakopmund is ideal for adventure seekers and action junkies. 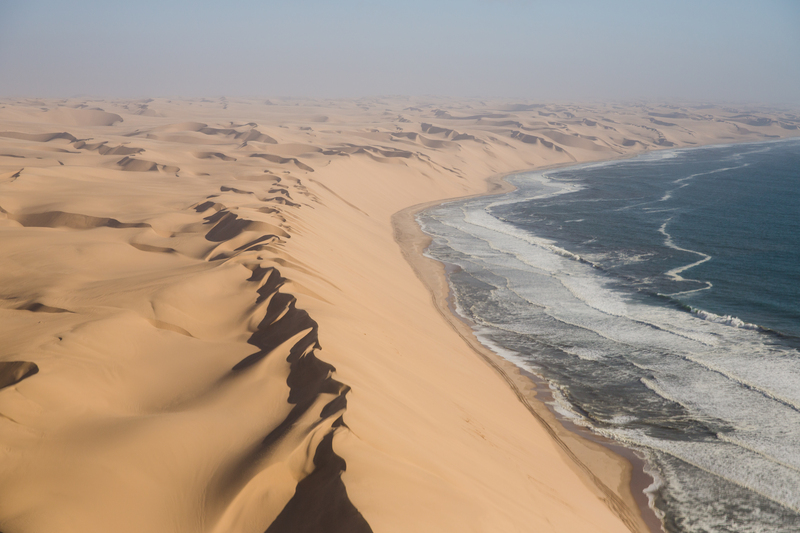 The picturesque coastal town is positioned between the iconic sand dunes featured in the latest Mad Max film, Fury Road, as well as the famed Skeleton Coast. And don’t miss the Sossusvlei scenic flight with Scenic Air for incredible aerial photos. The sand dunes that back Swakopmund and the surrounding coastline seem to venture off as far as the eye can see. Skeleton Coast is barren, empty and deadly, made infamous by its long history of shipwrecks that dot the rugged coastline. Skeleton Coast Park is best experienced on a day trip from neighboring Swakopmund, but if you wish to capture dramatic shots of the Milky Way rising behind a ghostly shipwreck, this is the place to do it. 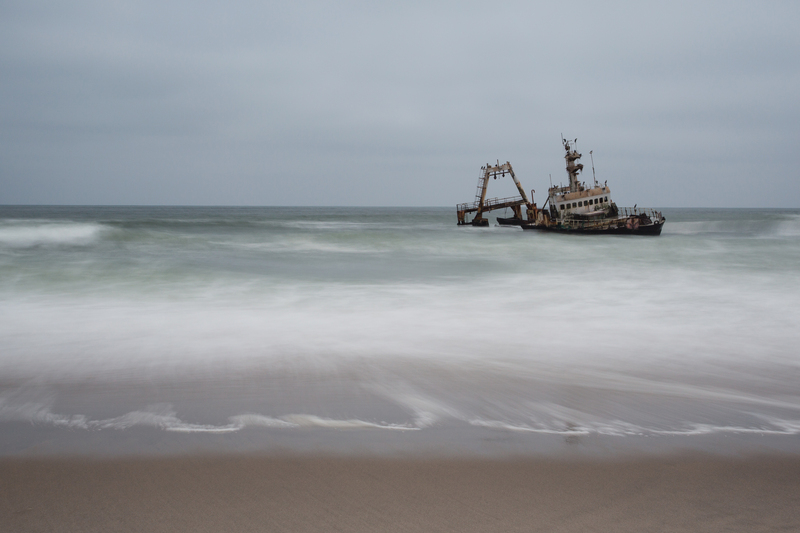 The rugged Skeleton Coast is home to countless shipwrecks, battered and beaten and left to decay in this remote corner of Namibia. Etosha National Park is your best bet if you’re going to Namibia to photograph the Big Five: Lion, elephant, leopard and rhinoceros, with the exclusion of Buffalo, inhabit the grasslands surrounding the massive Etosha Salt Pan, which covers almost 1,900 square miles. Just remember the best opportunity to photograph wildlife is during the winter dry season between May and October. 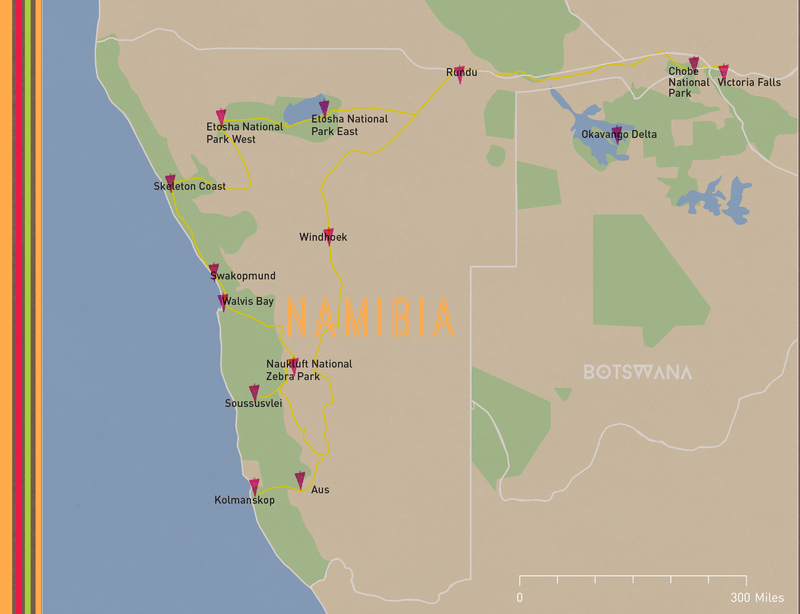 Where to Stay: Namibia Wildlife Resorts has many lodges and campgrounds within Etosha. Recommended are Dolomite Camp, Halali and Onkoshi. 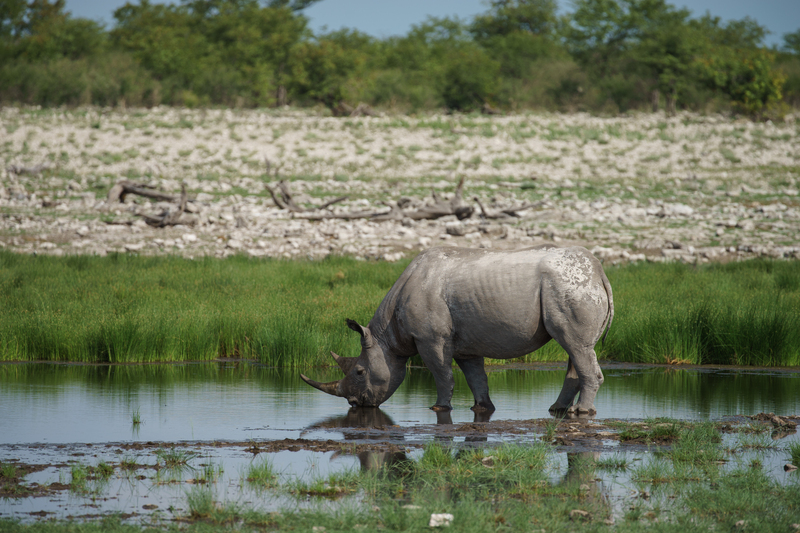 The Black Rhino, one of the most endangered species in the world, finds a safe sanctuary in Etosha National Park. Poaching has been almost non existent in Namibia for the last two decades. Chobe National Park lies in northern Botswana, just south of the thin Caprivi Panhandle of Namibia. This is a must-stop on the way to Victoria Falls. The easiest part of the park to access, the Chobe riverfront, also happens to have one of the highest concentrations of wildlife in Africa. Wet or dry season, you’re almost guaranteed to see hundreds (if not thousands) of elephants, giraffes and buffalo in the river and the surrounding floodplains. But be sure to hire a wildlife guide to embark on the drive with you, as the road is small and sandy, and you will not have much room to navigate should you run into an aggressive male elephant. 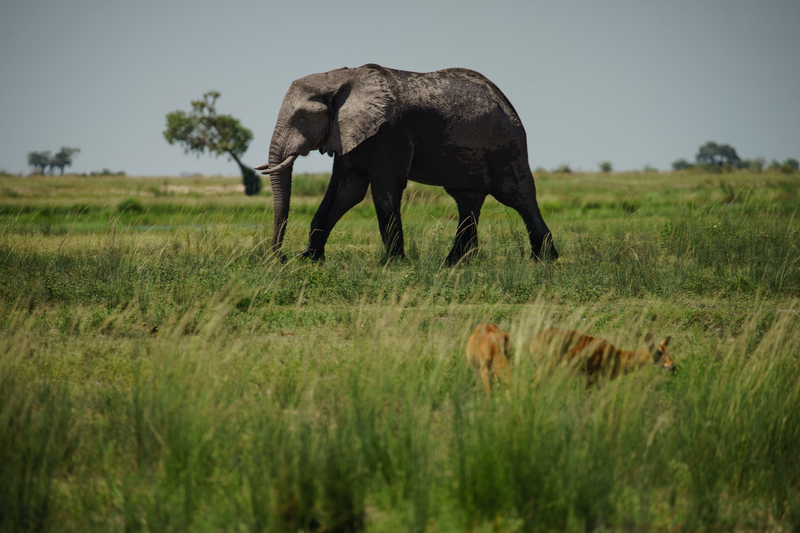 An elephant wonders through the marshland along the Chobe River in Chobe National Park, Botswana. Victoria Falls straddles the border between Zambia and Zimbabwe, Victoria Falls is the largest waterfall on Earth, with a width of 5,604 feet and height of 354 feet. During the wet months of December through May, the wall of water is an unbelievable site, with behemoth double rainbows shining over the vast, water filled canyon. During full moons, you can even see the elusive lunar rainbow. But beware: photographing in these conditions is near impossible—you’re enveloped in a constant downpour of thick mist. You may be able to get a couple decent shots, but unless your camera is weather sealed, do not keep it out of a dry bag for extended periods. Instead, hop on a helicopter tour with Zambezi Helicopters to fully understand just how monstrous this wall of water really is. 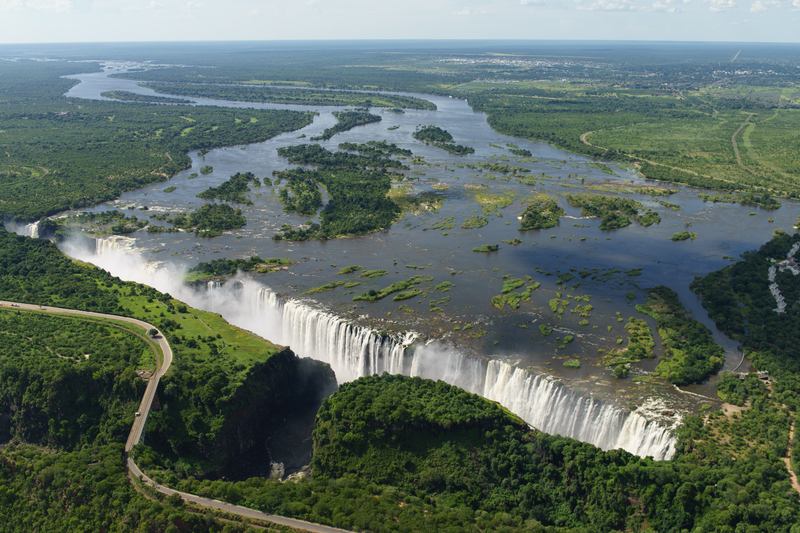 Victoria Falls is the largest waterfall in the world, and with such a massive wall of water, the best view is seen from a scenic helicopter flight. Okavango Delta is one of the Seven Natural Wonders of Africa. It’s located in Botswana, and is produced by seasonal flooding. Between June and August is when the Delta is at it’s peak, bestowing an incredibly high concentration of wildlife. Namibia is not a country where you can appease the boss by working remotely. Cellular Data service is almost non-existent outside of major cities, and Wifi is often unavailable (or very unreliable) throughout common accommodations and campgrounds. Be prepared to be off the grid for the majority of your trip. 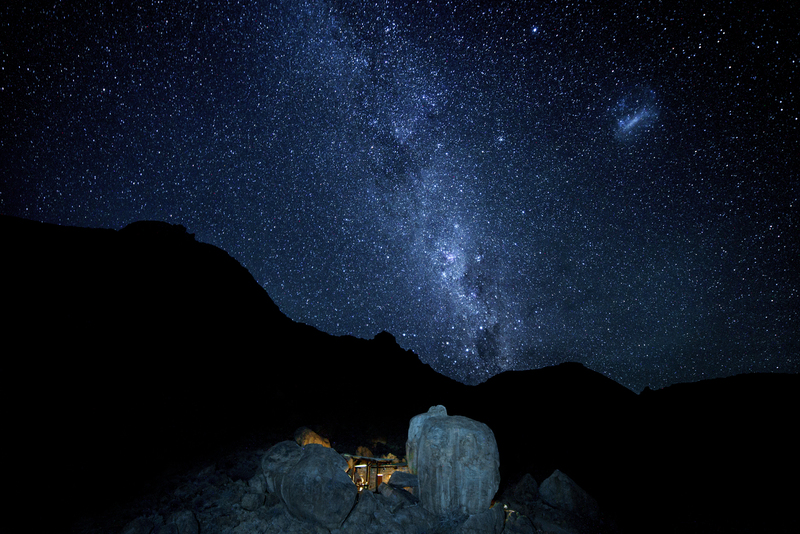 The Milky Way rises over our home built into the rocks at the Gondwana Collection Klein-Aus Vista. When on a photo safari, be sure to find a local guide. Most resorts and campgrounds have in house wildlife guides who not only know the best times and locations to find what you’re looking for, but know how to keep you safe in the event of an aggressive predator. A herd of elephants march towards a watering hole for an afternoon bath in Etosha National Park. With more than 60 percent of Namibia designated as conservation lands, wildlife is abound. Nocturnal creatures frequently cross roads, and since almost all roads lack lights, it’s likely you won’t see an animal until it’s too late. 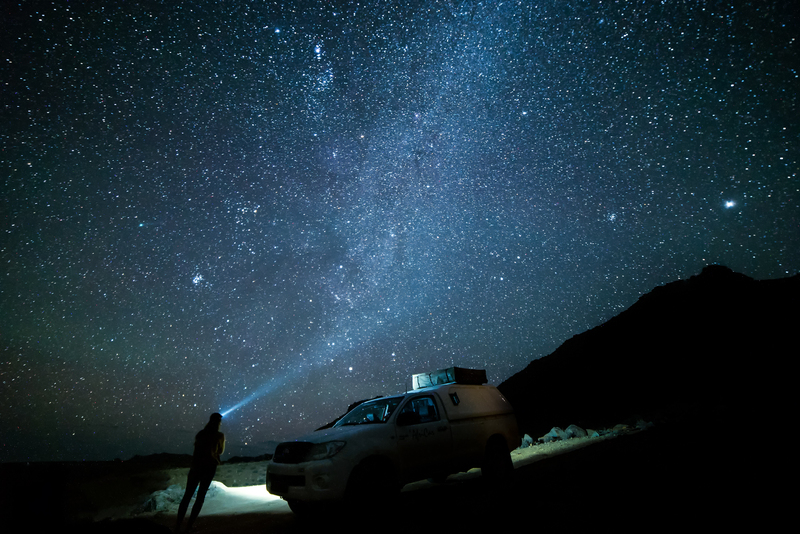 While driving at night is not recommended, using your adventure vehicle in night photo compositions is always recommended. And make sure you know how to change them. Many roads are unpaved with an abundance of sharp rocks. There is no AAA in this part of the world, so if your tire goes flat, it is up to you to change it. Tire repair shops only exist in major towns, so it’s important to have that second spare. You rented a 4×4 for a reason. Take that truck through the sand! Only drive on marked sand courses to preserve the sensitive ecosystem, but when you do find a good location, let some air out of your tires. Somewhat flat tires track through sand much easier than full ones, just make sure you have a powerful pump to replenish the air when you make it back to the pavement. If you are driving through deep sand, let some air out of your tires. This will help you navigate through without getting stuck. Many rental companies offer vehicles with a double fuel tank. Make sure you have one. Fuel is hard to come by in Namibia, so make sure you fill up both tanks every opportunity you get. Also, be sure to note the number of kilometers the tanks will serve and plan your fuel stops accordingly. Most tourist maps provided with your rental will have clear kilometer distances between fuel stations. If camping, power will not always be available, so make sure you have a power inverter to charge your camera batteries in your car while driving. Namibia has long stretches of dirt roads where you won’t see a town, building, or even another car or person, for hours on end. Always have your car stocked with plenty of food, water and supplies in case of an emergency, and let your friends and family back home know your planned routes. 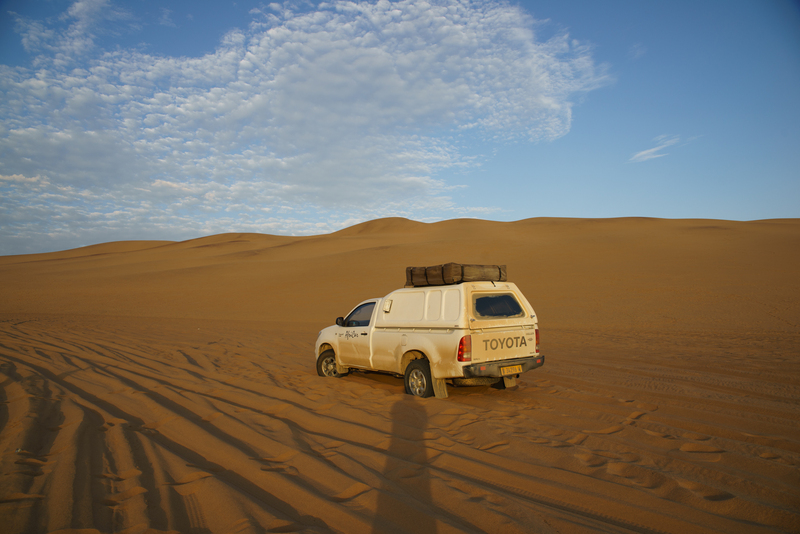 Often, you can drive down the dusty, deserted roads throughout Namibia without seeing another car or person for hours.